Winnipeg-based trio Human Music seemed right at home when we caught them performing in Thunder & Lightning bowling alley, in Sackville, New Brunswick. 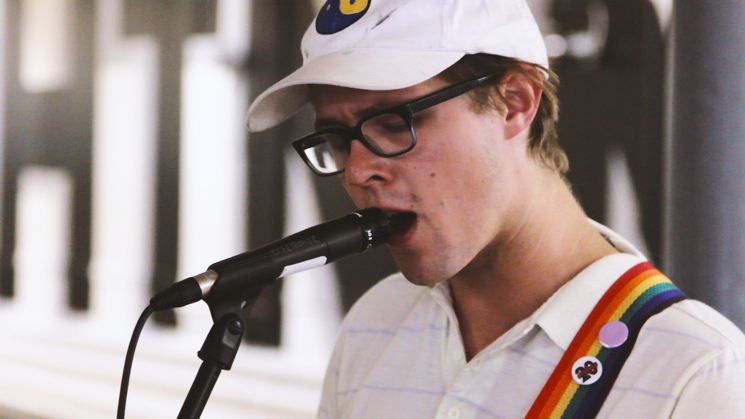 Their beach-ready pop jams fit in swimmingly with the disco ball-adorned, '70s-style hangout, so we teamed up with Pinball Sessions to capture part of their set at SappyFest last year for Exclaim! TV. Donning bright floral patterns, polos and baseball caps, Human Music are most definitely ready for the sun — and you will be too, after watching the set. You can practically feel its rays on your back as you ride the waves of their groovy jam "Sending Messages," or their chilled-out pop jingle "Dark Zone," the latter a cut from last year's Sup LP. If you yourself are a human who enjoys good music, do yourself a solid and watch the special double feature in the player below.